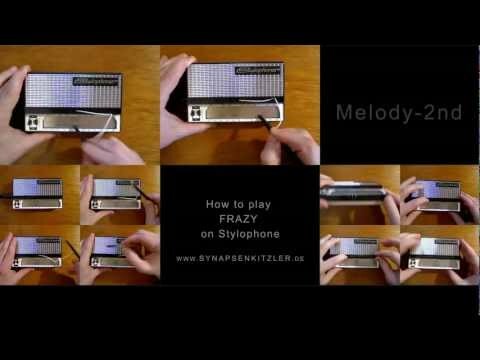 I made a Stylophone version of the track Frazy. Dude, that was a lot of work. I listen to the track on headphone, and played and recorded each instrument one by one and put all together in this video. 11 voices: Melody, Melody 2nd, Bass, 4xdrums, 4xchords. Note: Drums-Snare + Drums-Hi-Hat + Drums-Percussion are played on the Stylus cover and recorded with microphone. I used a common webcam for videorecording. You may notice some videosync problems (dropped frames). I want to keep it original, so i did not try to fix it in the videoeditor. The Stylophone is a miniature synthesizer invented in 1967. It consists of a metal keyboard played by touching it with a stylus. Controls: power switch, 3 Sounds, vibrato, volume, tuning control (on the rear). Some three million Stylophones were sold, mostly as children's toys. In 2007 the Stylophone S1 was re-launched. It closely resembles the 1960s original. Super Mario 64 Theme on STYLOPHONE 350s!!! HOW DO YOU PLAY FRAZY ON YOUR INSTRUMENT? Make a youtube-video how you play Frazy on your instrument and send the videolink to me.